The release and transfer are arguably the most important parts of the turn - as they will set up all the elements for the next turn as well. The purpose of the release is to end the previous turn by basically releasing the edges from the previous turn, whether carving or not. 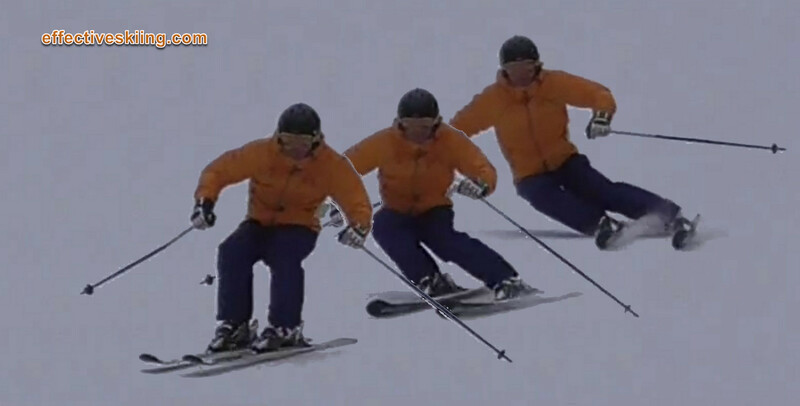 In general, the release movements start with the ankles to flatten the skis, then knees and hips and so on but sometimes the "COM is released first" i.e. the relaxation of muscles will "release" the upper body before the skis. It's an extreme case of the Flexed release, where the legs are strongly retracted. Common in bumps and high-performance skiing. Both skis are light in transition, the edges are switched as the skis are tipped. This is the typical application of the flexed release. A flexed release, when transferring weight/balance to the new ski, before it is on the new edges, so transferring to the little toe edge of the old inside ski before it is tipped to the new edge. Created when the muscle relaxation/use releases first the upper body, while keeping the skis slightly engaged a little while longer. Very similar to the Weighted release. Created by pushing into both or only the outside leg (extending or hinging over an already long outside leg) and hopping "up". Sometimes referred to as "up-unweighting" or "cross-over". The extension release is the most frequently seen in recreational skiing while the others are typical for expert and high performance skiing and racing. One of the important elements of a release is to extract energy from the turn - this is related to floating. Some perceive the flexed release as wasting the energy of the turn. That is in fact one of its advantages and why it is used in performance skiing and high-level racing. In high-performance skiing, we generate a lot of energy, as you see in the frames above: even with the strong absorption and the boots still came off the snow. The energy generated in a turn is in direct relationship to the edge angles at the apex and carving. The energy is highest in a carved turn on ice at maximum edge angles and lower in skidded turns at low edge angles (the skidding dissipates energy as the snow can't "push back") on soft snow. Extension releases may be useful in low-energy turns, skidded and pivoted and/or without much edge angles, where little energy is generated in the turn and the skier ads to it with pushing "up". It is a high level skill to extract as much energy from the turn, in the desired direction, as needed but not more! This is generally what we refer to as Impulse. The Speed control with retraction releases is a high level skill (we cover that at the black levels). Easy speed control is why an extension with skidding is often used on steeper slopes. If we resist the forces of the turn with a longer outside leg, we use isometric and perhaps eccentric contractions. extend, with concentric contractions, for an "extend to release"
The COM release is sometimes seen in speed skiing. The basic idea is that the body is released before the skis, generally via relaxation of specific muscles. At the same time, the skis are rolled off the edge, but it may result in something resembling an A-frame around the transition. Related to up-unweighting, this is based on a push and/or an extension of the legs, especially the outside leg, which will tend to push the hips and body "up". This will afterwards take weight off the skis and allow them to be released from the previous turn. Afterwards means when the pushing is completed, usually around skis flat. It is an older technique, called "up-unweighting" and usually followed by a pivoting of the skis - while the skis are disconnected from the snow and any rotation efforts or momentums easily affect their rotation. 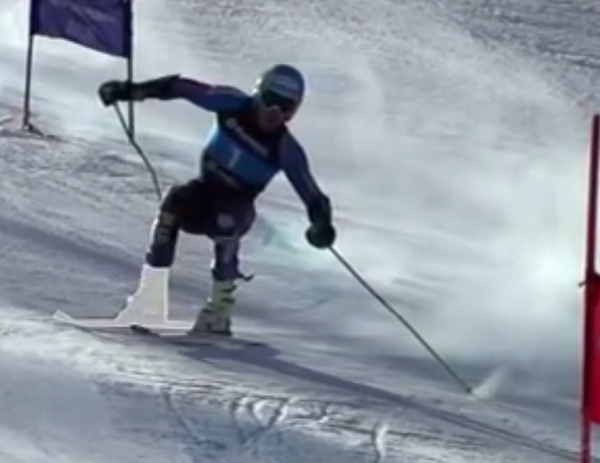 Typically, the skier in this case will flex the outside leg throughout the turn (giving into pressure) and then extend/hop at the end of the turn, to release the edges, hence the name "up-unweighting". This type of release is very common but less effective, as it usually leads to excessive up and down movements as well as a loss of control (while the hips are "flying" up and down, all you can do is wait for them to come down, to get pressure back on the skis). Member-only content avilable (179 words). The Garlands are a good drill to work on release/engage. The power release is great to hone your flexing to release as well. Viewed 1473 times ( | Print ) this page.